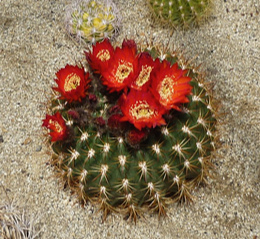 Some of you may be surprised to learn that the Echinopsis genus has been revised and now includes Lobivia, Tricocereus, Helianthrocereus, Pseudolobivia, and many other lesser known and rare genera. At the Mini-show all these genera will be accepted under their old names, as will hybrids and cultivars. The expanded genus now contains around 120 species, all of South American origin. The main reason for the consolidation is that although these species show variations in flower color, spination, and the body; in the wild there seems to be much natural hybridization and the former species and genera tended to merge at the boundaries of their range. 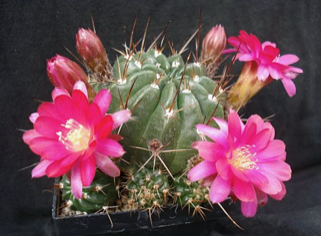 These taxonomic changes have been criticized by K. Trout, in particular the inclusion of the genus Trichocereus, and the formation of a huge, complex new genus without an accompanying monograph. Some problems also arose due to namespace collision when this merger was made. 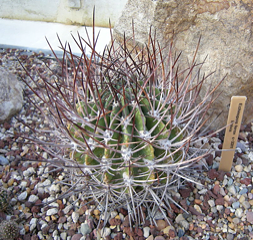 Most notably, there had previously existed both Echinopsis bridgesii and Trichocereus bridgesii, which are very different plants. 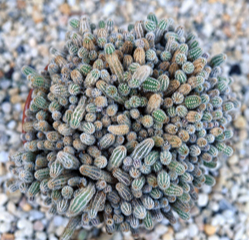 Echinopsis bridgesii is a short clumping cactus, whereas Trichocereus bridgesii is a tall columnar cactus similar to E. (or T.) pachanoi. 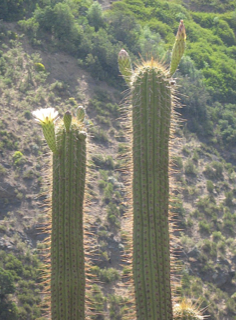 Under the new classification, Trichocereus bridgesii is known as Echinopsis lageniformis. 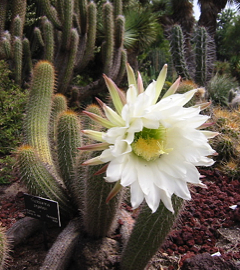 It should be pointed out that many people, still use the old Trichocereus classification, especially in ethnobotanical writings. While taxonomists have merged these genera, it will take a long time for name changes to take effect among collectors. 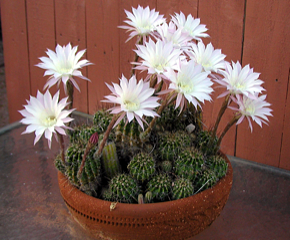 Echinopsis have flowers that are scaly and woolly with a prominent ring of stamens in the throat. 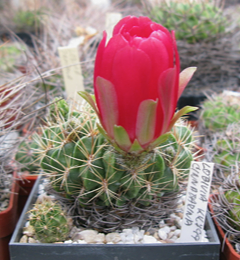 Lobivia generally have a short floral tube, flowers that open during the day, and have white or brightly colored flowers. 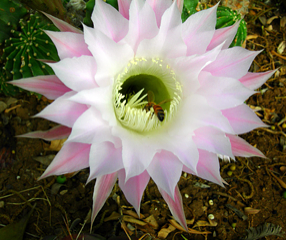 Echinopsis tend to have a long floral tube, and the species usually have white or translucent flowers. There are exceptions to these generalities however, and many intermediate genera were created and abandoned in attempts to clarify the relationships. 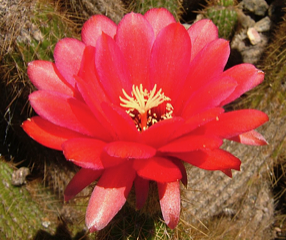 There are species that intergrade between Lobivia and Echinopsis and Trichocereus. 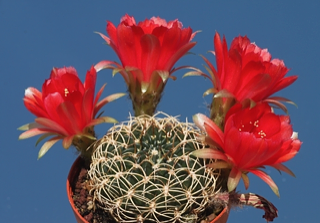 Named for Dr. Carlos Bruch, 20th century cactus collector in Argentina. 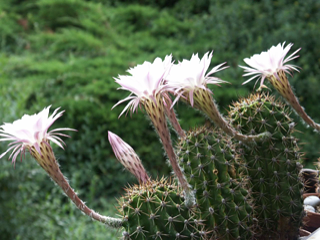 From the Greek chamai (ground) and cereus (wax candle, torch). A local vernacular name in Argentina that means ‘orphan’. Named for Edouard Spach,19th century Alsatian (French) botanist.